Having a reliable putting stroke makes golf much more fun. Putting can be extremely frustrating for a golfer because success depends on both mastering the mechanics of the putting stroke and developing what is referred to as "feel," a sensitivity in the hands that helps translate the information the golfer has acquired while reading the green into the type of stroke he must make. Putts that are pulled or pushed offline often can be traced back to the golfer having an inconsistent stroke. A primary cause is the left wrist breaking down as he swings through the putt. One way to stabilize the left wrist is to change from a traditional putting grip to a reverse overlap grip in which the left index finger is placed between or overlaps the last two fingers of the right hand. Also make certain both thumbs extend down the top of the grip, and are not turned to one side. On a putt with a sidehill slope, many golfers end up missing the putt on the low side because they don't allow for enough break. There is no chance to make the putt because it slides down offline before it reaches the cup. By playing more break you give the ball a better chance of dropping into the cup as it curves down from the high side. On the practice putting green, golfers should deliberately allow for more break than they actually see to determine if that increases the number of putts they hole. A golfer can get so focused on trying to estimate the break on longer putts that she ignores the critical factor of distance. The result can be difficult second putts of 5 feet or more. The instruction book "Private Lessons" suggests trying "the ladder drill" to learn better distance control. Imagine a ladder lying on the green with six rungs that are all 3 feet apart. Start 10 feet from the bottom rung of the ladder. Try to hit a putt as far as that first rung. Then aim for the second rung, which is 13 feet away. Continue until you are aiming for the top rung, which is 25 feet away. This drill helps a golfer develop a better feel for how hard to hit her putts. By pacing a putt off on the course before she hits it, she can estimate it is 22 feet long and know hard to hit it. 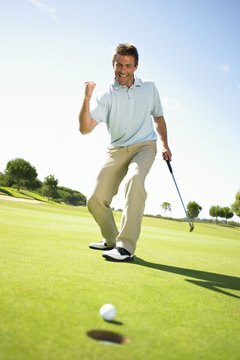 Short putts can give a golfer fits, because he thinks he should be able to sink every 5-footer. Each time he misses, his confidence in his stroke diminishes. As his anxiety increases, he moves his head before completing his stroke, which moves the putter blade offline. One way to combat this problem is by listening for the ball to drop into the cup, instead of looking at the cup to see if it dropped. This helps you stay still over the putt and the sound of the ball dropping consistently boosts your confidence. During a round, players face short putts from uphill, sidehill and downhill lies. On the practice green, try using one ball, hit putts from a variety of slopes and memorize the correct stroke for each situation. Sliding, sidehill 6-footers won't be as stressful if you hit a lot of them on the practice green.